Discussion in 'Tank Journals' started by ashburn2k, May 9, 2017. 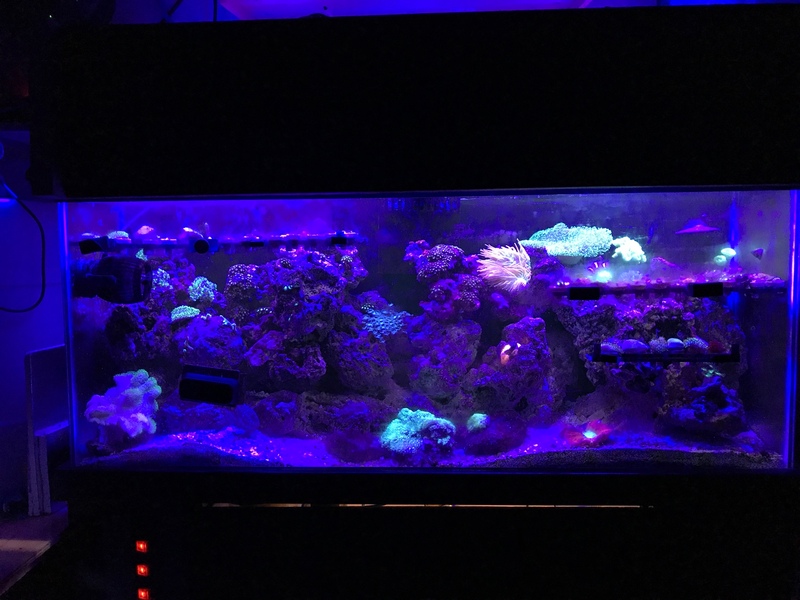 I've pretty much had tanks from 20g to 120g ( not reef ready ). and after a tank crash in the office ( i was away for a 3 week trip in tibet, my co-worker forgot to add water to my topoff reservoir ) I pretty much got depressed and stayed away for a while. so fast forward 10 years, and a wife later, I wanted to start a tank again, but the wife knows how expensive it is, she just veto the idea, so I told her that I can keep the cost to minimal or free, with that, I began to look for free tanks on Craiglists and a long time friend pointed me to here and joining the BAR community and boy I was so happy that I found you guys. so fast foward a year later, I have my 55g long with customized hood and diy lights, 30g long sump and mostly free or cheap. I will get to my frugal gears soon. and once again, thanks goes to those who gave out free frags and equipment !! without you, I wont have a tank this nice today. SamHa, Gablami, jepoy and 1 other person like this. Yanno, if I didn't have tangs I would very seriously consider a smaller tank in this range. You can really do a lot to keeping it healthy, aquascaping it like you want, heck being able to do a 50% water change without much headache alone would keep you going well. The only downside would be fish limitations. Coming from a 120g, i know that i want to keep a smaller tank this time around. I will add more photo later with my other setup. and just got a smaller 12g ( or 8? it's 24x12x8) shallow frag tank. Hahaha. Cheap or free? She bought that line? Did you meet her online and say you looked like a male model? Must be gulible! Now just tell her that your tank is only 20 gal and you want to have a 75 and you can get like a 225 and she will never know! Baykes and tankguy like this. I believe him in regards to him being able to get stuff cheap or free. Every time something pops up for free I see him sending pm's. Newjack and L/B Block like this. Yeah with this club and some time, a completely cost free tank besides water and electricity costs is definitely possible. But yeah, it would be hard for me not to sneak stuff in here and there. Your patience must be boundless dear sir! I've updated my post with sources for my tank, so you can see 'free' tank does happen if you work for it. and which shows how awesome this club is. Looking great! I can't wait for our toadstool to grow! Great to meet you today. It was a blast to get a frag knowing we contributed some free parts. Such great folks in the club! I think that's the trade off. Nanofish vs large water changes. I would love to keep a variety of tangs (yellow, hippo and Achilles just to start!) but I have a 40g. But water changes aren't a huge production and you can redo the aquascape in a day if you want. Decided not to do another frag tank, instead I cleaned up my sump area and added a crate above cheato. You can run the frag lights on reverse cycle from the main lights. This is true. I think it's been noted before that the chaeto like more the red spectrum where the corals like the blue. You may be able to get away with a more white color light that has both the blue and red. With your chaeto being under the frag rack (that is how it's working right) it might not be able to get enough light with all the shadowing. Let us know how it works. Use light from above for frags and a different light from the side for chaeto. I was thinking that may be a good possibility too. I think @roostertech does this.